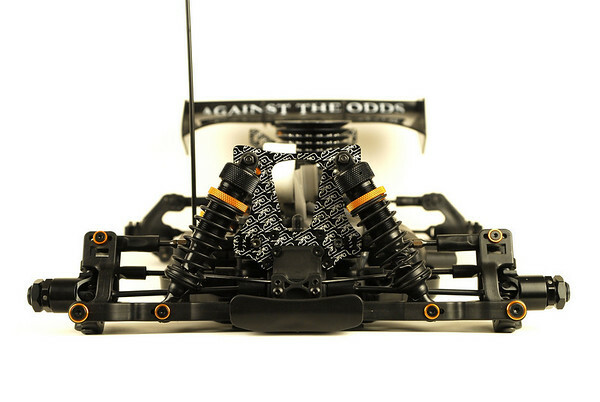 Most cars have numerous locations for upper links/arms, some have plastic inserts for the arms so they can be positioned differently, wheel angles can be changed, rideheight, downtravel adjusted etc. There are a whole host of tuning possibilities that can be done quickly and simply, without the need for disassembly, or the changing of oils. These set-up changes, are minor changes on their own (within reason, a couple of holes or a few degrees), but when a number of set-up parameters are changed together, they can have a profound impact on the handling of the car. To find what combination suits you best, the only way to move forward is to try everything yourself, and write down the results. Then after many test sessions you will figure out which things need to always stay the same, and which you like to change in certain situations, in order to fine tune the car. A lot going on there. Many things to adjust, many things to think about. The front wheels’ toe-angle is normally set to 0, so the wheels are parallell, or a few degrees toe-out. Toe-in on the front is never used. Personally I feel that the front toe-angle makes a very small difference in the handling of the car. More toe out should actually make the car more stable, contrary to what most people think. But I think the difference is small unless you go crazy with it and ad many degrees. Toe-in on the rear however, makes a big difference to the cars handling. Normally people run between 2-4 degrees toe-in on the rear. More toe-in increases rear traction, and makes the car more stable and easy to drive. It reduces overall steering, although some people claim it increases initial steering into the corner. However I always feel more rear-toe = less steering. More rear toe-in can also make the car want to flip over more easily, specially on high traction bumpy tracks. The right amount of toe-in to run, depends very much on your personal driving style. I like to run the least amount of toe-in I can get away with, which usually means 1.5-2.5 degrees on most cars, and 3 on THE Car. Camber angles are always negative, in an effort to get the smoothest traction when cornering. The more the wheels are leaned over, the less sidebite the tyres have, and this means it is less prone to flipping over. 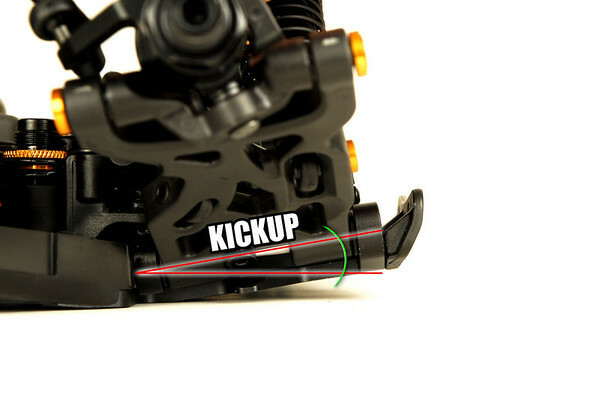 The reason for not running very large amounts of camber is that forward traction is reduced as camber is added. Camber isn’t really something people change very often, as it doesn’t have a big impact on the handling. I don’t even measure the degrees I run, I go by feel, and then measure the upper link, to make sure it’s the same on both sides, and then I always set my camber by the measurement. In degrees camber normally varies between 2-6 degrees. Front and rear the same, or rear slightly more. It is a good idea to measure the upper links to make sure they are the same on both sides. I dont even measure the angle. Caster is set by changing the casterblock on a c-hub car, or moving the upper arm back on a pillow-ball front end car. Caster changes how much the front is raised up when the wheels are turned, and also the size of the contact patch between the tyre and the track, and how much the tyres lean over when turned. This changes the forces that act on the tyre as the wheels turn, and the traction they can provide. But what is important is how caster effects handling. Overall Caster angle is 24 degrees in this picture. This includes Kickup of 8 degrees and the angle of the hub, 16 degrees. 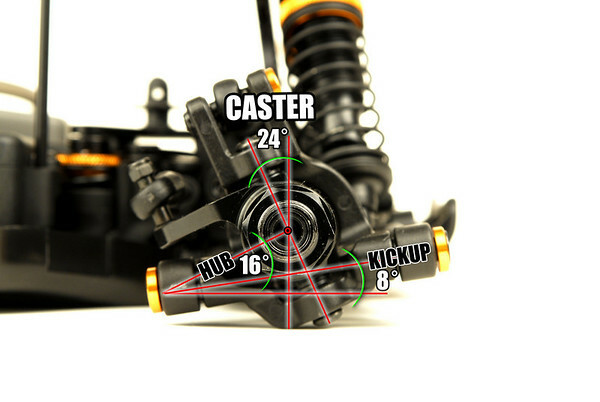 Some set up guides state the effect of caster as the opposite of what can be found if one tests it on a 1:8th scale buggy. This is a good example of how vehicle dynamics theory that can be found in books and the reality at the track differs. I think that theory is good in order to get an idea of how stuff works, and in order to get ideas for what to try. But it doesn’t always get the effect on the handling right, as in 1:8 buggies, compared to real cars, the wheels are turned a lot more, and the size of the obstacles, and the speed carried, and the weight – power ratios are so different. Anyway that’s my theory. A smaller amount of caster will make the car twitchy, and more precise and hard to drive. The steering is very responsive and the car turns a lot into the corner, but not as much in the corner and when accelerating out of it. Increasing caster will calm the car down, it won’t turn as much into corners, but will have more steering in the corner, and when accelerating out. The car will specially have more, and more consistent smoother steering in long sweeping corners, that are driven on-power. Large amounts of caster also make the car more stable in bumps. Large amounts of caster require the driver to be on-power a lot, in order to get the most steering out of the car. Generally less caster is best for small technical tracks, and for low traction, and larger amounts is good for more wide open, flowing tracks, and high traction. But in reality caster isn’t really changed much by the top drivers. I don’t change it because I find what I feel works best, and then I stick to it, because I am comfortable with it. Whatever the situation is, I have a feel for how the car will turn, and it won’t surprise me. Kick-up for the front-end, and anti-squat at the rear. The front of the chassis is bent up, normally about 8 degrees. On most cars the front arms can also be set, so the angle they are at, when viewed from the side, is the same, less or more than the chassis 8 degrees of kick-up. Kickup angle, hingepin compared to horisontal. More kick-up on the front makes the car go better through bumps, and makes it jump better, specially on jumps with rough uneven faces. More kick-up also reduces steering, specially steering response, as it calms the car down, and makes it smoother. The car will transfer more weight, as the front will rise when accelerating and lower under braking. This can have the effect of making it easier to brake around hairpins as the weight is transferred to the front, and the rear slides round. Less kick-up makes the car more responsive, and better for smooth and for high traction tracks. The car will be more stable on high traction tracks due to less weight transfer. 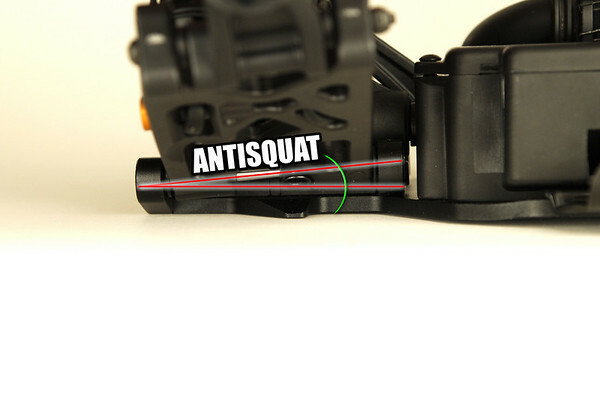 The rear arms, are angled in a similar way to the front arms, but alot less, normally between 2-4 degrees, and this is called antisquat. Sometimes some drivers like to use very little 0-1 degrees, and some like a lot, up to 6 degrees, but 2-4 is normal. Different brand cars react slightly differently to the amount of anti-squat, so if 3 degrees feels good with one car, it may not be so great with another. Anti-squat does exactly what the term implies, it reduces the amount, the rear of the car squats under acceleration, and rises under braking. Anti-squat only affects the handling of the car when accelerating or braking. When the car is just coasting it wont significantly change the handling. More anti-squat is good for high traction tracks, and it increases on-power steering, and also steering into corners, specially directly following jumps. Drivers with aggressive driving styles tend to prefer a lot of anti-squat also on bumpy tracks, while smooth drivers may prefer less. Less anti-squat will be smoother when accelerating in bumps, if your driving style is smooth enough. Less anti-squat also increases traction. Personally I like to run a lot of anti-squat, 3 – 3.5 degrees on all tracks. The Ackermann angle is simply put the difference between the turning angle of the inside and outside wheels when the wheels are turned. When a car drives in a circle, the inner wheel will be following a smaller circle than the outer, so in order for there to be less slip, the inner wheel should turn more to compensate. Ackermann sounds simple at first, but in-fact, the Ackermann angle, and the steering geometry as a whole is hard to figure out as it is affected by the suspensions movement, caster and camber, and wheels aren’t always either straight or at full lock, there is an infinite amount of points between those positions as well. 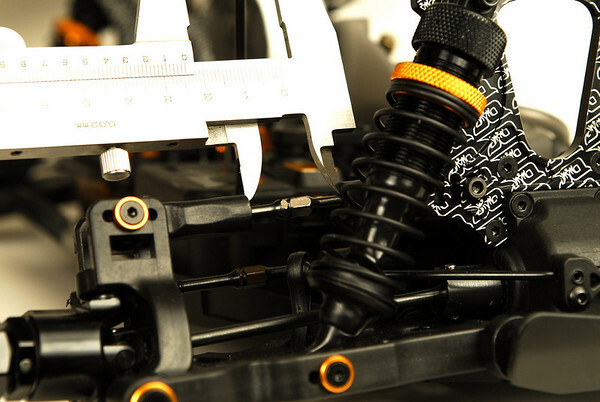 There are currently two main types of steering systems in use in 1:8th scale buggies. The old-school type, which is found on most, for example, Kyosho, Xray and Mugen, where two steering bellcranks are connected by a plate, and the steering links are attached to this plate. With this system the steering will always feel non-linear, meaning that at some point in the corner, and at some speed, the car will turn more than at others. By moving the link back on the rack, Ackermann is reduced, and by moving it forward, it is increased. These changes decide where the most steering occurs. With the link towards the back, the steering is more responsive, and the car will turn more into corners. With the link moved forward, the car will steer more in the corner and out of it, and it will be less responsive, with less steering into the corner. The more the link is moved forward, the later in the corner the most steering will occur. 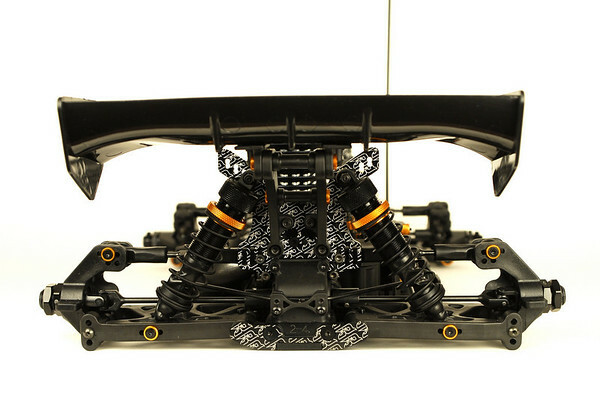 The second steering system type is the one found on for example the Losi and THE Car. The steering bellcranks are still connected by a plate, but the steering links are connected directly to the bellcranks. With this system the steering is more linear, and it doesn’t seem to have a point where it steers most. Ackermann is changed by changing the length of the connecting plate, and there are multiple sets of holes in the bellcranks, so they stay parallel to each other regardless of which plate is used. With this steering system it seems like the different plates change the overall amount of steering, instead of the point at which the most steering occurs. I feel this is a better system as the steering is linear, and overall steering can be adjusted. The short plate has the most aggressive steering, but interestingly has most Ackermann, which seems like the opposite the effect of more Ackermann with the other steering system. This is best for tight tracks. The long plate has the less Ackermann, and has less overall steering, and makes the car smoother and better on more open flowing tracks. The upper links are really valuable tuning aids. Most cars respond well to changes to the upper links. I think it is important to remember that the upper links, eventhough they are at different ends of the car, actually need to be set up so they work together. If the links, front vs. back, are set up very differently, long/short, small angle/large angle, chances are that the cars front and rear ends will roll, and act so differently, that the car feels like it is fighting itself. I try to always keep the links similar, as this makes the car work in the most controllable fashion. In general, longer links make the car more calm, and gives it more traction, and actually even improves forward bite. Having the links as far in on the shock towers as possible, makes for the most stable car. Raising the link on the tower, has a similar effect of lengthening it, in that it gives more traction. Short links make a car more responsive, and make it square up better and faster when exiting a corner. It can feel like it has more traction, and ultimately it does, but it is more uneven. The car will have a lot of traction up to a point, and then it will suddenly loose it, spin out or similar, so it won’t be as easy to drive. Lowering the link on the tower will have a similar effect, as a shorter link, and will make the car be more responsive, and have less traction. The front upper link is a good tuning option on most cars. I will discuss a front upper link, not arm, but all of this applies to the cars with front upper arms also. Changing the front upper link changes how the car turns, responds to driver input, and how much traction the front end has. In general, a long front link will make the car more calm, it will have more traction. A shorter link will make it react and change direction faster. Lowering the front link on the tower will increase steering into the corner, but can also make the car flip over easier, specially while cornering. Raising the front link on the tower will make the car more stable, less steering into the corner. Going too high, may make it hook suddenly as the car slows down as the car is negotiating the corner. Lengthening and shortening the link on the tower, or on the hub, has a similar effect. This is a bit of a hard nut to crack, but I feel, that the further in the link is on the tower, the more stable and consistent the car is. The further out the link is on the tower, the more non-linear, and inconsisten the car is, even if the length and angle of the link is kept the same. By nonlinear I mean, that it acts different at different speeds, or if traction changes, pushes, then turns, or similar. It will also roll less and have less traction. On the hub, it seems different, on the hub, it seems like it stays consistent, and the effect is more evident. A long link on the tower or hub is more stable, gives more traction, more steering mid to exit of the corner, and a short link is more responsive and gives more steering into the corner, and less overall traction. The rear link I find, is more critical to get right than the front. When trying different rear link locations, and you get it spot on, it feels like the car does everything better. The rear link will mainly determine the amount of traction the car has, and how it slides when cornering. Lowering the link on the tower, will give the car more steering, as the rear will start sliding more in corners as you turn. It will also square up better when accelerating out of corners. Raising the link on the tower will add traction and reduce steering. Lowering the complete link gives more traction, but the car seems to maintain more steering, than when lengthening the link. In general, a long rear link makes the car more stable, have less steering, and be more predictable and easy to drive. A short link gives more steering, and initially the car can feel like it has more traction, but it will lose traction suddenly, instead of a predictable way. Again, the further in the link is on the tower, the more stable and consistent the car feels, the further out it is, the more non-liner and and inconsistent it feels. The car will roll less and have less overall traction. A longer link on the hub or tower will give more traction, and less steering, the car will be more stable. A shorter link will give more steering, specially into and mid corner, and the car will square up and accelerate straight better.